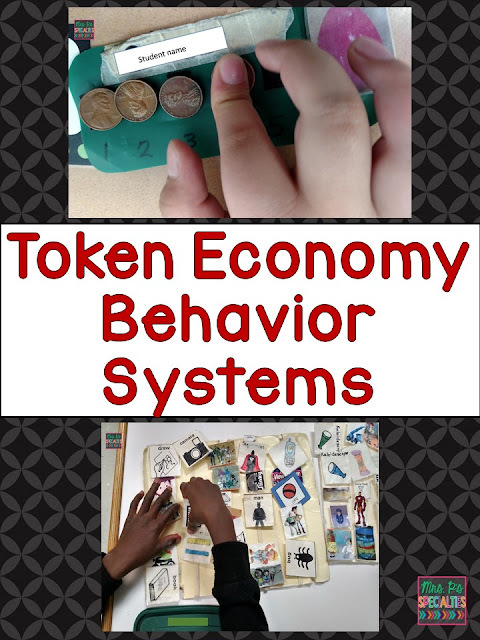 Using A Token Economy System | Mrs. P's Specialties! I have had a lot of questions lately on what type of behavior system I use, so I thought I would do a post about it. We use a token economy based system to reinforce and encourage positive behaviors. This is an easy system for both staff and students and offers some excellent benefits. *The system helps students learn to recover from a difficult time or disappointment. Not earning during morning meeting doesn't mean the student has to have a horrible day. Instead, students can try again with the next activity. *Builds in a self-monitoring component. 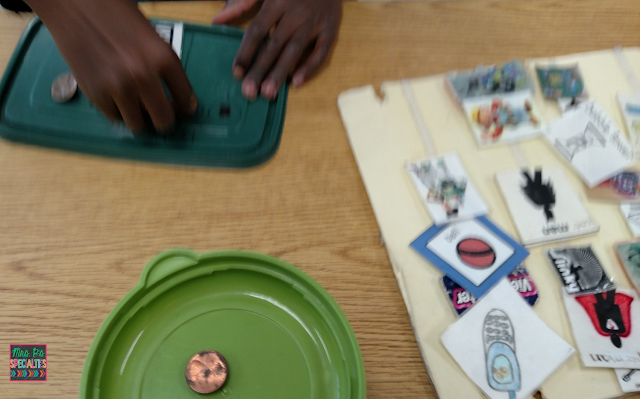 Students can determine how they are doing based on the number of tokens or pennies they have. We begin each activity or subject by having the students choose a picture of the reinforcer they would like to earn. The group I have this year is able to deal with a larger field of choices, so we have all of the reinforcer pictures on one board. Use individual choice boards for students who aren't able to handle such a large field. I like to use one board when I can because it can expand variety of the reinforcers students choose to work for. This student is picking his reinforcer picture (paper) from the board. Students attach the picture of what they are working for to their token strip. We use pennies for our tokens, so we call the token strips penny strips. All penny strips, regardless of what they are made out of, have a few things in common. All of the penny strips have the student's name on it, numbered spots for pennies and a spot for the picture of the reinforcer. 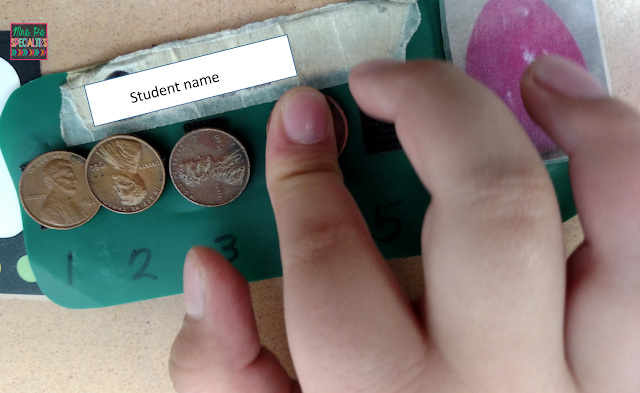 Once we have begun the activity or task, students earn pennies for meeting their individual behavior targets. This is where you can very easily differentiate the system. For example, during morning meeting you might give a penny to Johnny for keeping his hands to himself, Ben gets a penny for stating the whole date, Matthew gets a penny for sitting quietly and listening to Ben, etc. If a student isn't meeting his behavior targets or begins to get off task, I can easily direct the student back to what he is working for with this system. To do this, I would say something like this (while pointing to the picture of paper), "Do you want the paper? Then you need to pay attention and count with us." Students "cash in" their pennies at the end of the period...usually every 30 minutes or so. To cash in, students have to count their pennies into me. If the student earned all of his pennies, he would tell me what he earned and go get it. If the student didn't earn all of his pennies then we talk about WHY he didn't. Even if the student doesn't have all of his pennies he still needs to count them into me. Here is a video of the student cashing in for his earned reinforcer. This is also a great opportunity to practice counting skills. After cashing in, the student gets a couple minutes to play with the item he earned. Here the student earned paper to draw on. If the student didn't earn his item, he needs to sit quietly at his desk while his peers play with their reinforcer. This is a great opportunity for the student to realize how much they really want to earn next time! While you always want your students to succeed, it is important for students to experience the feelings and consequences of not earning. It helps to motivate them to earn all of their pennies even more. Most of the time, my students work for activities or toys. There are times when my students work for edible reinforcers instead. Here is what the board for those times look like. Candy corn is a BIG hit in my classroom! If you are going to use edible reinforcers, I believe it is important to do so sparingly. When my students earn an edible they get ONE piece of the candy or item. Using edibles sparingly helps keep them powerful reinforcers while reducing the chance of adding weight to the student. *Once a student has earned a penny or token, you can't take it back. If the student stops meeting his behavior targets then he stops earning pennies. This rule keeps the focus on the positive behaviors and reinforcement. *Adjust the number of tokens a student has to earn to meet the needs of your students. If the student needs more frequent reinforcement to stay on task then his penny strip might only have 2 or 3 spots for pennies. If the student is earning 2 pennies then he will cash in every 10 minutes while the student who is working for 3 pennies cashes in every 15. I would love to hear how you use token systems in your classroom. Have they been successful for your students? Don't forget to pin this post to refer back to it. Share it with friends! You shared a lot of excellent information here -- thanks so much! I have a couple of questions: If a student earns his 5 tokens before the end of the activity, do you allow him/her to cash out then, or do they wait til the end of the activity? I have been allowing them to redeem their tokens as soon as they get to 5 but this can be disruptive, so waiting til the end of the lesson/activity makes so much sense, but I've always been told that reinforcement should be immediate. My other question is: If all students "cash out" at the end of the activity, but some don't have 5, do they keep what they've already earned and keep earning during the next activity until they reach 5 (or whatever number they are working for) or do they "lose" what they've earned and start again? Just wondering. We dole the pennies out so students don't earn their fifth penny until the end of the activity which is when we cash in. If a student doesn't have enough pennies to earn at cash in, he still has to count his pennies in to the leader and then we talk about why he didn't earn. For example, he wasn't listening, needed too much help to stay on task, etc. We use the token straps every half hour, so we also talk about what the child has to do in order to earn next time. Everyone starts again at the next activity or group. My students have the opportunity to earn 5 pennies every 27 minutes. The other 3 minutes are cash in time.